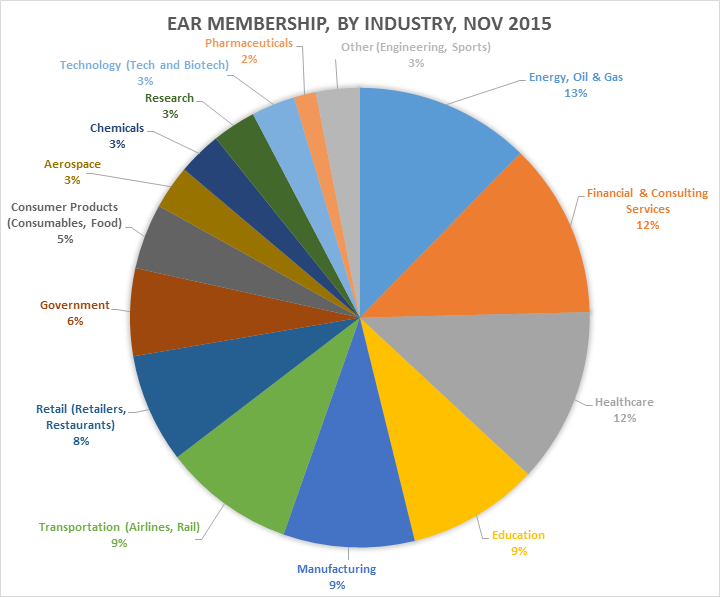 The current EAR membership provides services to over 3,000,000 employees worldwide. Bi-annual conferences are held across the country in April & October. Programs are provided by EAR members and global presenters. The Employee Assistance Roundtable (EAR) is an organization of internally managed employee assistance programs from both private companies and non-profit organizations. Members include Fortune 100 and Fortune 500 companies as well as smaller companies and organizations and include high tech, banking, railroad, engineering & construction, oil, utilities, manufacturing, airlines, telecommunications, aerospace, government and educational institutions. EAR was established in 1985 to provide a forum for confidential discussion among the managers of these EAPs. The objective is to profit from each other’s experience and expertise through an open exchange of information on topics such as program design, policy development, referral resources, comparisons of treatment resources & other issues that may develop. An atmosphere free of solicitation opportunities provides the freedom to express current concerns for the industry with confidentiality a priority. The current membership provides service to over 3,000,000 employees worldwide. The bi-annual conferences, in April & October, are held across the country for membership convenience. Conferences include presentations from both the membership itself as well as world renowned leaders in the EAP field. Past presenters include Dr. Jeffrey Mitchell on Critical Incident Stress Debriefings, Dr. Ron Kessler of Harvard Medical School, John Broyles, Senior VP of Global HR for DuPont, Dr. Dudley Weeks on Resolving Conflict in the Workplace and many other noteworthy personalities. Other presentations have addressed HIPAA, Workplace Violence & Resiliency.